We are often asked what signs indicate that a septic tank should be pumped out; our answer is that it really depends on whether you are pumping it out for maintenance or because there is a problem. If you are pumping out your tank as part of a good ongoing maintenance practice, there are usually no “signs” that it needs to be pumped — your septic provider will pump and clean the tank according to schedule, and the system should operate properly. Here’s more info on how often your tank should be cleaned. Pumping the septic tank can give some temporary relief if the problem is due to the septic system, but may not fully resolve the problem. Easing the load on your septic system can also help, but if your system is backing up or failing you need to call a professional as soon as possible. 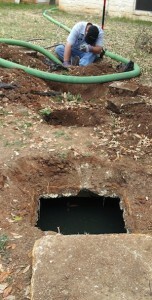 Your septic tank should be pumped before you experience any “signs” of a need for a pumping. Don’t wait until it’s too late! If your septic tank has not been pumped in the last 3-5 years, call Van Delden at 210.698.2000 or contact us online to schedule a cleaning today.